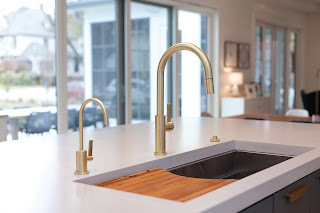 Kitchen and bath design aficionados report that brass finishes are not just back but predicted to come on strong in 2019. In tune with the growing wave of homeowners pursuing a warmer, homier look at the kitchen sink, California Faucets presents its most distinctive lineup of classic brass finishes yet. Made with materials reflecting the quality of yesteryear in styles that maintain a modern flair, the brass finishes range from satin brass, with its eye-catching bling, to the more rustic burnished brass. Because all California Faucets products are made of 100-percent brass, finishes such as burnished brass and satin brass offer a new way to enjoy the beauty, quality, and luxury of this fine metal. Featuring a finish that will patina over time, burnished brass speaks to today’s homeowners’ growing appetite for industrial chic design, blending the high quality of brass with a rich vintage look. Satin brass (PVD) is slightly shinier, like classic brass, and in a PVD finish. Up to eight times harder than chrome, PVD finishes come with a lifetime warranty against tarnishing. In addition to the trending brass tones, California Faucets’ entire Kitchen Collection is available in a selection of more than 30 artisan finishes, including 15 PVD finishes with a lifetime guarantee against tarnishing.